Islamic terrorist are now called “fixated persons” & “lone wolf obsessives”– the lunatics are not just running the asylum, but they are also hiring a team of shrinks to blow smoke at exasperated Australians. Victoria Police revealed it was preparing to investigate up to 300 so-called “fixated persons’’ a year. preparing to investigate up to 300 so-called “fixated persons’’ as part of a new drive to prevent lone-wolf terrorist attacks as it emerged accused Flinders Street attacker Saeed Noori spent two weeks as an ­involuntary psychiatric patient earlier this year. Police yesterday revealed 32-year-old Mr Noori, a mentally ill ­Afghan refugee and ice addict, had referenced Allah and mentioned spy agency ASIO in comments made from his hospital bed late on Thursday. Fourteen people remained in hospital yesterday after Mr Noori drove his white Suzuki Vitara into a crowd of pedestrians crossing Melbourne’s busy Flinders Street at 4.41pm on Thursday. Nineteen people were taken to hospital and three of those victims remained in a critical condition last night. Nationals from China, Italy, India, Venez­uela, Ireland and New Zealand were among those injured, as was an off-duty police sergeant who was hurt as he struggled to restrain Mr Noori in the moments after his car came to a halt. The attack generated instant controversy, with Victoria Police under fire from for not labelling the incident a terrorist attack after it emerged Mr Noori had made several bedside “utterances’’ indicating he had been motivated by perceived injustices perpetrated against Muslims. Victoria’s Acting Police Chief Commissioner, Shane Patton, said Mr Noori spoke of his “dreams’’, but also referenced Allah and made a rambling comment about Australia’s domestic spy agency, ASIO, which gathers intelligence about terrorism suspects. He also attributed his ­actions to avenging the persecution of Muslims around the world. 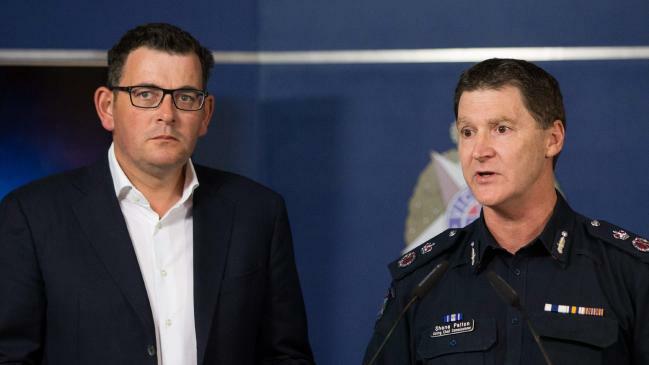 Mr Patton said he was briefed on the utterances about 11pm on Thursday, after he had addressed a press conference with Victorian Premier Daniel Andrews in which he declared there was no evidence of a terrorist motive. Home Affairs Minister Peter Dutton said authorities had not definitively ruled out a terrorist link. “I don’t want to pre-empt anything, but we are certainly not ruling out a terrorist link and we certainly aren’t drawing any conclusions at this stage,” he said. Privately, police were increasingly confident that Mr Noori, who has a long and documented history of heavy ice addiction, would not be charged under Victorian or federal terrorism legislation. Rather, he will face prosecution for attempted murder and conduct endangering life. Yesterday, police searched Mr Noori’s housing commission home in Melbourne’s Heidelberg West and another property belonging to his family in neighbouring Oak Park, seizing computers and other items. Mr Patton said counter-terrorism experts had examined Noori’s online activities and searched ASIO’s intelligence holdings and found no evidence linking him to any terrorist organisation, suspected terrorist or extremist ideology. Mr Patton said for a crime to be considered a terrorist incident, there needed to be a political, religious or ideological motivation. “The reality is, we have got a man who has got mental health ­issues, who is on a mental health plan and who has drug issues, and then he commits this act. “You take into account, what are the circumstances about this person? What are his views he has expressed before? Is he expressing any support for terrorist groups or anything like that? We haven’t got that here. We haven’t seen that. We have, if you like, isolated comments made in an interview. The Weekend Australian has been told Mr Noori was committed for two weeks as an involuntary psychiatric patient earlier this year. He is also a heavy user of methamphetamine, or ice. Authorities suspect he may have been suffering from the residual effects of post-traumatic stress disorder as a result of his life in ­Afghanistan. Stop making excuses for Islamic savages, you imbeciles! The decision not to declare the Flinders Street attack a terrorist incident was made by the joint management committee, a counter terrorism steering committee made up of assistant commissioners from the Australian Federal Police, Victoria Police and ASIO. The committee convened by phone hook-up on Thursday and decided the legal threshold had not been met to charge Mr Noori with terror offences. How many escape hatches are there? Malcolm Turnbull said whatever Mr Noori’s motivations, his ­alleged crime was a cowardly and despicable act. Not as cowardly & despicable as our political clown gallery and the “authorities” who refuse to do what needs to be done against Islamic terrorism. “We should continue to go about our daily lives in the way we always do, and that means spending time together with family and friends in public spaces, on the streets of our cities, at sporting stadiums, in parks, going out, doing our Christmas shopping … that is a fundamental part of our lives,’’ he said. Blah blah blah. Candlelight vigils, anyone? The revelations about Mr Noori’s past came as Victoria Police revealed it was preparing to investigate up to 300 so-called “fixated persons’’ a year. The new police division will draw on mental health information held by the Department of Health and Human Services, as well as the mountains of police intelligence holdings gathered across the state. Its aim is to identify the scores of potentially violent obsessives who live in the midway point between criminality and mental illness. The team will initially comprise a squad of five detectives and five mental health workers, including a forensic psychiatrist, but will ­double over the course of a year as its workload expands. So at one dozen 10 shrinks get themselves cushy positions blowing smoke at Australia’s much maligned taxpayers? Speaking before Thursday’s ­attack, Victoria Police Assistant Commissioner Ross Guenther said the new unit should be operational by February. “We’ve come to the view that we’ll probably have around 200 to 300 high-risk people,’’ Mr Guenther said. Fixated persons units have been running for years in Queensland and more recently NSW, as well as overseas. They have become increasingly important for counter-terrorism police as they recognise the role mental illness can plays in terrorism, particularly when it fuses with Islamic State’s highly persuasive propaganda. The relationship between ­Islamic extremism and mental illness is controversial, some ­arguing any emphasis on mental illness diminishes culpability in radical Islam in motivating terrorists. He emphasised the new unit would not come at the ­expense of aggressive policing of hardened extremists but would broaden the measures available to police to counter potential ­attackers. “It recognises the risk of breakdown of mental health across the community,’’ Mr Guenther said of the new approach. The unit’s health officials will provide information on a suspect’s interactions with the health system, such as hospital admissions or any history of drug abuse or mental illness. Privacy concerns would be managed via a memorandum of understanding between police and health authorities, Mr Guenther said, adding that police would not be “sitting at the terminal’’ examining people’s medical histories. He said many of the people who found themselves targeted by the fixated persons unit were those who had fallen between the cracks of the health ­system. Police would have the option of intervening early with a mental health plan that would see them treated rather than arrested. … you know the “authorities” Victorian Police are answerable to – not the citizens (citizens are the ones who have to obey the police) !!! … assisting a murder (even by saying nothing) is a major felony !!! … and hold the “authorities” accountable for their seditious (demands of the Victorian state’s police force – for one) and the treasonous aiding and abetting of the islam invasion of Australia – for another !!! • Purge islamophiles … Here There Everywhere – in all ways !!! • see (who overseas) who signs the islams (and the criminal African Tribals) into Australia – a plane load every day (just of islams) – move along – no boats here ! • who imported (against national security advice) the Lebanese islams … John Malcolm Fraser AC, CH, GCL (21 May 1930 – 20 March 2015) – revoke its Honours ! • the suicidal self-hating cultural marxists who are (“our”) politicians (their) bureaucrats (the) (w)academics and (those) PC’d mind controlled uneducated dolts of Australia’s INFILTRATED political legal and educational institutions !! !